It has been requested that this article be rewritten and expanded to include more information (tagged on 00:16, 13 August 2017 (EDT)). 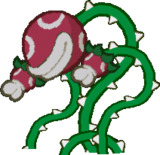 Lava Piranha is an enormous Piranha Plant boss in Paper Mario who, as its name suggests, dwells in a pool of lava. Lava Piranha bears some resemblance to the boss Naval Piranha from Super Mario World 2: Yoshi's Island, except smaller and with fewer buds and tendrils. 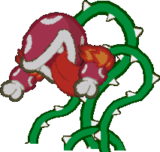 Lava Piranha has a large tongue and white ring markings instead of filled white spots on its head, like typical Piranha Plants. Goombario and Koopa Koot refer to Lava Piranha in plural terms, suggesting there is more than one Lava Piranha in existence. Given its Japanese name, this is likely referring to Fire Piranhas. The Lava Piranha featured in Paper Mario is the ruler of Mt. Lavalava on Lavalava Island. It is found in a small lava pool where the other Piranha Plants report to him. Lava Piranha speaks in shouts and shrieks, blathering out insults at Mario when it confronts him for the fifth Star Spirit, Misstar, whom Bowser ordered the fiery Piranha Plant to guard. Its attacks are rather simple. Most of its attacking is done via Lava Buds, which can spit out Petit Piranhas. When it attacks, it spits out an orb of fire at Mario that does five attack damage to Mario. After Mario initially defeats Lava Piranha, it suddenly emerges from the lava and gets forty more HP. This time, Lava Piranha's head is on fire and its tongue is sticking out. If Sushie is Ultra-rank, her Tidal Wave ability stuns Lava Piranha for two full turns. After the second round, it slowly falls to the ground and then sinks back into the lava, relinquishing the Star Spirit. It has a cameo appearance in the credits of Paper Mario, poking its head out from behind Lavalava Island, alternating with Raphael Raven. 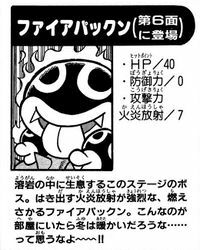 In Super Mario-Kun, the Lava Piranha is encountered after Sushie destroys a Spiny Tromp. Mario and his partners attempt to attack it by using a Snowman Doll, but it results in Kooper getting crushed. The Lava Piranha then spews Lava Buds that attack Mario and his partners. Sushie then encases Mario in Water Block and squirts Lava Piranha. Mario walks out of the water block and shouts, distracting Sushie. Lava Piranha then burns and injures Sushie. Despite this, Sushie inflates Mario with water and pushes him to Lava Piranha. Mario bursts, spraying the water over Lava Piranha and thus defeating it. Tattle This is a Lava Piranha. Lava Piranhas are plants that can somehow survive in lava. Max HP: 40, Attack Power: 5, Defense Power: 0 They blow out huge balls of fire to attack. That is one big flower! Wow! Tattle This is a Lava Piranha. Lava Piranhas are plants that can somehow survive in lava. Max HP: 40, Attack Power: 5, Defense Power: 0 Since their bodies are on fire, you'll take damage if you step on 'em. Don't worry if you're fireproof. They'll try to burn you with their fire breath. They're creatures born of fire, so water attacks will work extremely well against them. Due to a glitch, if the player uses the Double Dip badge and then uses an Egg Missile on Lava Piranha, the game crashes. In the Super Mario Mash-Up Pack in Minecraft, the Wither is replaced by Lava Piranha. This page was last edited on January 30, 2019, at 14:40.